TrackIR comes in handy with that! You can quickly duck your head to see what's left and right of you. I believe A2A is using their sound engine to include different sound levels depending on the situation. E.g. if you open the canopy, the levels increase and you hear the wind. That's taken care of by their custom code though and cannot be ported over to the Vega. The lower level interior sound you hear is probably the sound set you hear with the headset on. While I recognize the importance of proper sound with the aircraft, I'm not an expert on the matter and I am currently busy getting some external expertise. But rest assured that there will be proper sound coming with one of the future updates. Handheld radio is done, and so is one of the "secret features" I was working on. Looks just like the real thing! Had to look in my flight bag to make sure you didn't take mine! Now that 0.04 is out, it's time to have a look at the goals that were set for this update. Everything considered, I am very pleased with the progress and all goals, but one were met. There were some obstacles in the way this time - first and foremost the OOM bug that cost me about a week to resolve. And I hope the new walkaround interface came as a nice surprise for you. 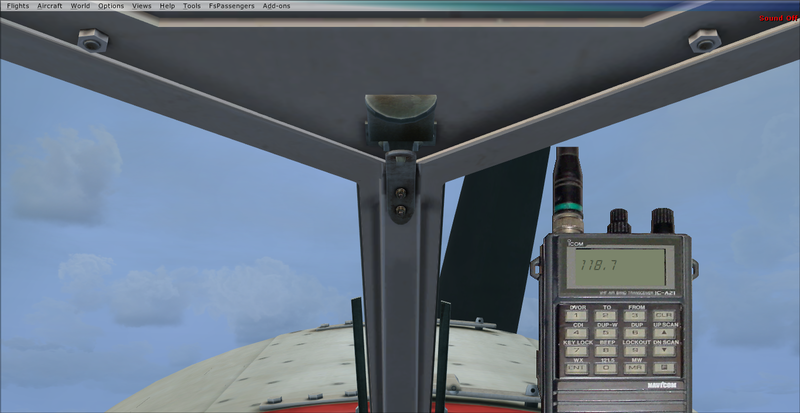 I also incorporated some of the suggested changes like the addition of the handheld radio. I'll write up a feature list for v0.05 in the next days to set the goals for the next round of development.